Enjoy panoramic views over the landscape and the sea during your holiday in Liguria, Italy. The village of Vezzi Portio is an ideal place for free climbers. The steep rocks around the village provide excellent possibilities for your next climbing excursion. Living very close by in the small village of Magnone Inferiore, and hidden away behind the farm houses, is the lady called Giuseppa Piscitello (Azienda Agricola Piscitello Giuseppa, Borgata Magnone 10), who produces home-made, excellent, delicious honey which is sold under the brand name “Pollupice” in the surrounding shops. Furthermore she has her own herd of sheep and also produces very excellent home-made cheese. Located in San Filipo and San Gorgio are two churches bearing the same names - San Filippo and San Giorgio. San Giorgio also has an interesting Beekeeping Museum, which shows more than 2.000 exhibition items, all of which are about beekeeping. Vezzi Portio comprises of four localities, namely Magnone, San Giorgio, San Filippo and Portio in the hinterland of Noli. The town was divided into two main parts, Vezzi and Portio. Vezzi was part of the Castellania of Quiliano, which were under the rule of the Del Caretto family. The latter gave the area to the town of Savona in 1142, and in 1261 to the Cicala family of Genoa. Portio was part of the margraviate of Finale and it then joined the Republic of Genoa in 1713. With the coming of Napoleon’s rule, both villages reverted back to the Ligurian Republic in 1797, and in 1805 they became part of the first French Empire. In 1861 Vezzi and Portio were integrated into the Italian kingdom, after the fall of the Sardinian kingdom. From 1973 to 2008 they were part of the mountain municipality of Pollupice. 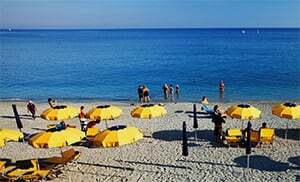 Vezzi Portio is a village in the Savona province which lies in the Liguria region. There are several other villages near Vezzi Portio, for example: Voze (5 km), Verzi (8.8 km) and Tosse (3.5 km). When travelling on the E80 from the direction of Genoa, take the exit to Spotorno then follow the Via Guardia towards Tosse. Thereafter, turn onto Via Spotorno and drive straight towards Vezzi Portio.